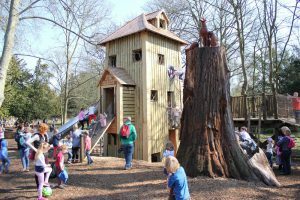 Pupils at The Collett School can now enjoy a truly unique and magical learning space with the addition of a treehouse classroom and library to their school. 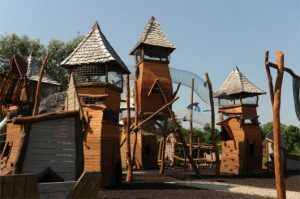 The two treehouses were unveiled at the beginning of term as the school’s first outdoor leaning facility, offering children an exciting mix of imaginative design and sweeping views over the grounds. The Collett School take great pride in being a happy and encouraging environment where children with complex learning difficulties can learn and develop on an individual level. The two treehouses, complete with raised decks and connected by rope bridges, provide an exciting school experience like no other, with pupils looking forward to their lessons in the treetops. Traditional Blue Forest curves, natural materials and cedar shingles were all incorporated into the design, providing a new and inspirational environment for the children to engage with. Simple play features such as a slide and climbing net help to encourage children’s sensory, physical and social development in a fun and stimulating way. Enclosed around the bases of two mature trees, the treehouses help the pupils to interact with and explore the natural world around them. Nothing is more magical than having childhood memories of a treehouse and as these children grow up they will certainly be able to look back on their school years and remember clambering over the rope bridges and watching the wildlife with friends. Hazelwood School’s outdoor learning environment has been greatly enhanced by the addition of a fantastic new Blue Forest Tree House. The unique classroom-in-the-trees sits approximately 3m from ground level.